I think they both mean the same thing – it just depends on which English is spoken! I honestly feel that I am right but I am willing concede a bit…..the meanings are the same so lets proceed! Saturday was a rainy day early on but did settle down by the time my daughter’s Birthday gathering got underway – I had the duty of preparing the carnivorous treats for the evening. When turning meat into yummy and satisfying treats I usually keep a cold beer nearby so I can pull in a nice long sip as I contemplate what I need to do next. I am on the patio, the smoker is heated up. The water pan is well filled with my favorite form of water. It is “water” that has been boiled with the heavenly flavors of malt and hops. Yes, it is beer, my favorite form of “water”. I used a couple of bottles of my Imperial Stout and a bottle of a homebrewed session ale (4.8% ABV). I also added about 5 tablespoons of crushed garlic to the mix. Three chickens were cut in half lengthwise, covered in John Henry’s East Texas Pecan rub! Smoke was provided by pecan wood brought home from the Ciliske’s ranch. The hard work was having the patience to let the slow cooking and smoke do its magic. My penchant for peeking too often loses too much heat. So, I sat back became mesmerized or mesmerized watching the bubbles break out of solution in my pint glass of homebrewed Father’s Day Ale! Earth to Bishop, Earth to Bishop! What, what – oh yes let me continue. The Father’s Day Ale seems to have become more mature & mellow as it sat in my little 6L Tap-a-Draft kegs. Time to brew some more. I had to be careful with the mesmerizing or mesmirising image of the bubbles in the beer lest I fall into a hypnotic trance and forget to quaff – not cough….quaff! Thankfully I held up nicely, the chickens were amazing and the evening was a success! Could it have been my talent, or simply my choice of ingredients? It didn’t really matter, I received the kudos with humility and a knowing smile. I reluctantly went into my stash and pulled out a few 22 ounce bottles of my Pumpkin Ale….about 8 months old and very nice! I am now down to 2/3 of the 6L keg of the Father’s Day Ale, 5 bottles of the session ale and about 20 bottles of the Imperial Stout. The stout is also very nice but another few months will allow it to mature and mellow toward perfection. Caution – when watching the attached clip, remember to breath and look away regularly or risk mesmerization! Hopefully 12 seconds is not enough to cause a problem. Basic Texas dinner with a California twist. 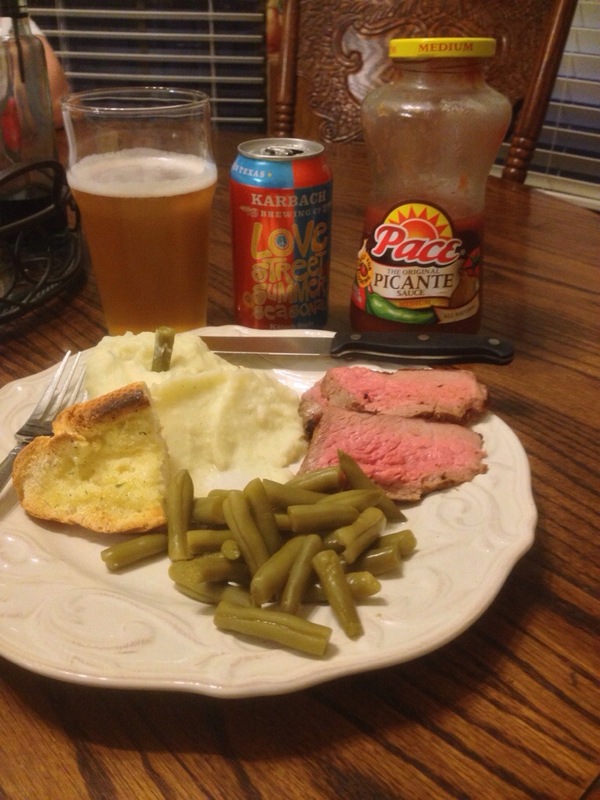 The Texas component was beef, beer, green beans, mashed taters, a local beer and salsa. The California component was the cut of beef. Tri-tip is a cut that is found all over California after originating along the Central California coast over 40 years ago. It is tough to find in Texas! I went into our local HEB supermarket yesterday not intending to buy the tri-tip. I was looking for ground sirloin and chickens for my daughter’s birthday BBQ on Saturday. I found the chickens but no ground sirloin. I spotted two tri-tips on the top shelf and snatched them both up. Tri-tip makes great leftovers, sliced up in a salad, wrapped in a tortilla or just plain old finger food! I was drooling! Saturday will be my famous burgers and smoked chicken along with a gut busting variety of dips, queso and who knows what that my wife has found on Pinterest! I am in charge of the meat and beer, both of which I claim a tremendous depth of knowledge and abundant experience! The local beer, a Karbach summer seasonal that slid down way too easy. On Saturday a select few that know the secret handshake and password may be treated to some of my he brew. What a nice change of environment, three plus days out of the Houston heat and humidity. The only drawback – I wasn’t able to share this trip with my wife. I know sooner or later the benefits of a mostly empty nest will be evident. What does mostly empty mean? Our oldest son has finished all of his on campus requirements for graduation from LSU’s Construction Management Program – one remaining class that can be completed via distance learning. It is cheaper to have him in Houston with us until all of the boxes for graduation are checked off and the job search begins. The second night of the stay my workmate and I visited the Rockslide Brewery & Restaurant. Side note; the state of Texas has taken a giant step forward with recent legislation easing some of the restrictive regulations for small brewers and brew pubs but still lags far behind Colorado, California and others. The next night we drove about 15 minutes out of town to the little village of Palisade. The drive took us through some of the vineyards and orchards that cover the Colorado River Valley in this more temperate part of Colorado. There is a mall brewery in Palisade, Palisade Brewing Company. 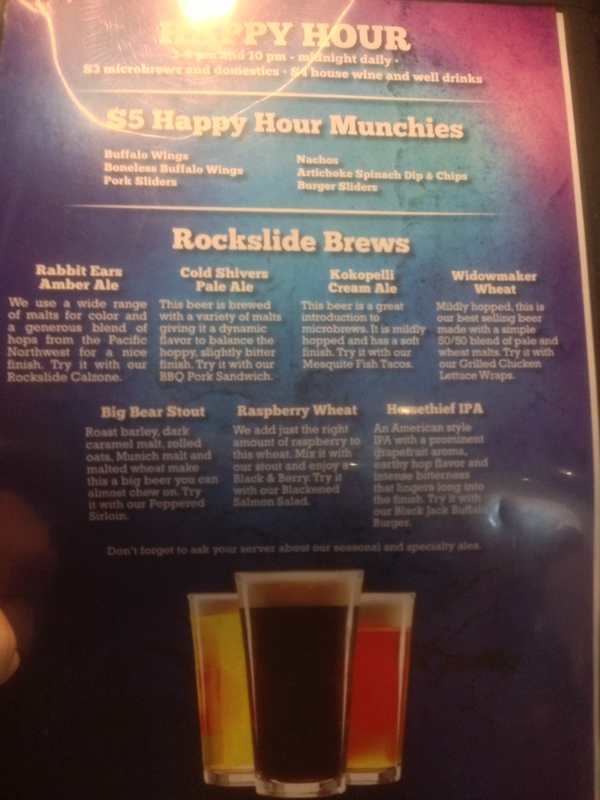 Let’s talk about Rockslide Brewery and Restaurant. Located on Main St. in the old downtown section of town that has been nicely remade. The road has been shrunk to two lanes that meander around small plaza like areas sprinkled with benches and pleasant landscaping. It definitely slows traffic but adds a nice quaint old town feel. The restaurant is bright, clean and was hosting a party celebration of some sort in the back half of the upstairs seating area. The waiter had decent knowledge of the beer offerings and I have to admit, the food menu was broad enough to satisfy most visitors. 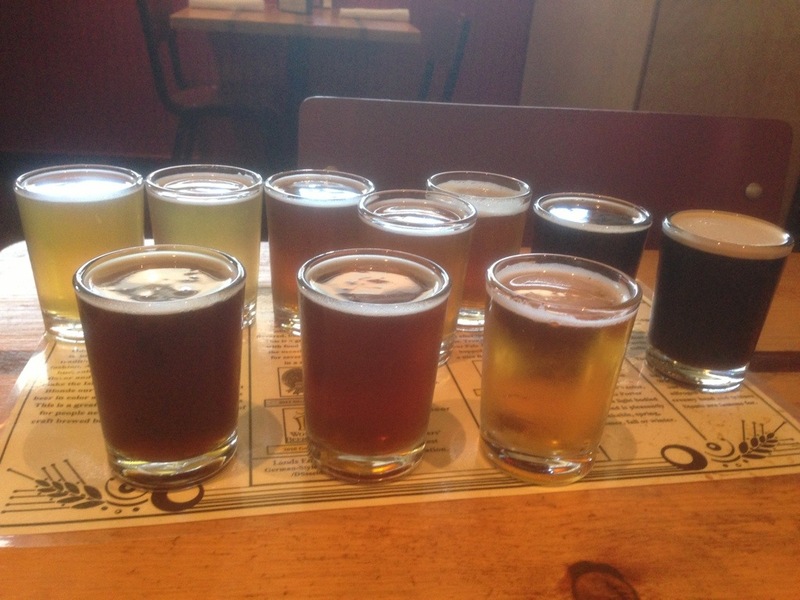 My travel mate tried the Widow Maker Wheat – “pleasant and easy to drink” were his comments. 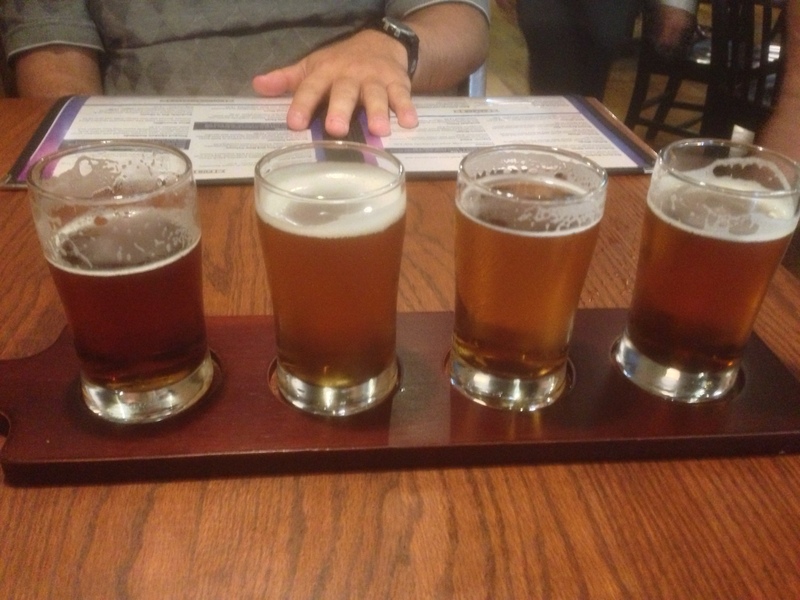 Me, I went with the four beer flight, Rabbit Ears Amber, Cold Shivers Pale Ale. Kokopelli Cream Ale and the Horse Thief IPA. They were all very good beers, the IPA was my favorite but that shouldn’t be a surprise to anyone. The food fare – my work mate had the fish and chips with a twist. The twist was – the fish was battered salmon rather than cod. He said it was surprisingly good. I had the steak salad, medium rare and it was perfect with their house Balsamic dressing. Palisade, small village as I mentioned before, and the journey to the brewery is only for those that know where they are going, have been there before or you are paying close attention the GPS. We had a driver, one of the client reps that attended the training session, who also happens to like good beers. He was a bit tentative but eventually we turned down the right street and pulled up at the brewery adjacent to the railroad tracks. We had the good fortune of live music out on the patio on a perfect evening for dining and sipping al fresco. The seating was ample but all three of us noticed an odd split in the seating designations. At least 75% of the seating is designated for SMOKING! That is right, only 25% labeled for the non-smokers. If it hadn’t been for the three of us occupying 3 of the 20 plus seats on the no-smoking side it would have been empty. The smoking side was packed! Another observation, I felt like I had been transported back to the 60”s. The crowd was very reminiscent of SFO’s Haight Ashbury in the heyday of the 60’s hippy movement. I wonder if the 2012 ballot initiative that passed in Colorado had any influence on the seating arrangement and attendees. 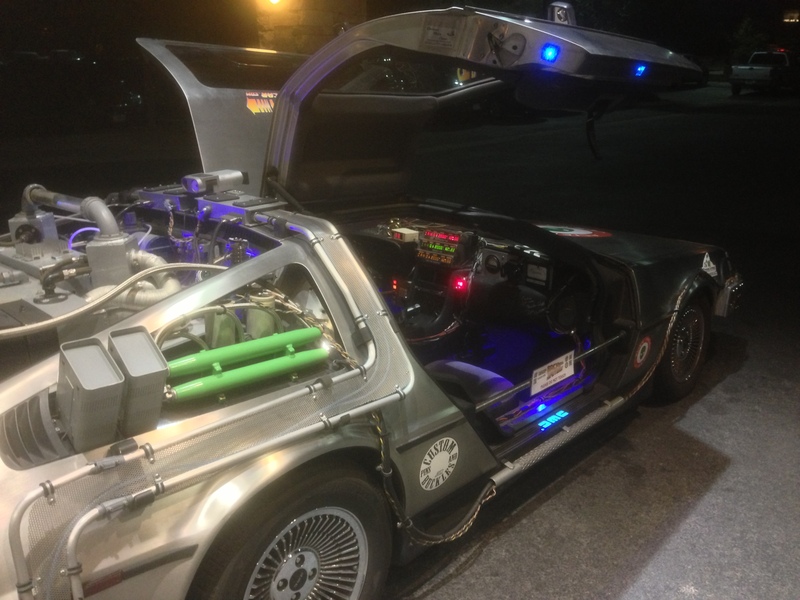 More about being transported back in time later in this post. Food was typical pub food with lots of Jalapenos available for every dish if you so desired. James, my workmate, had a huge appetizer portion of Nachos with the Blonde Ale offering. Our client driver, Rob, hmmmm, I forget what he ate but we both ordered a flight of beers, 6 beers served in 4 ounce Mason jelly jars. High marks to the brewery. Not a bad or even average beer in the bunch. I gave high marks to all 6 beers sampled. Rob enjoyed the High Desert Red, James the Laid Back Blonde Ale and me, the IPA, so well in fact, that I followed up with a pint of that nice IPA……Rob was driving! The “Off Belay IPA” was really, really good in my estimation……that is why I sampled it twice in order to confirm my first impression. 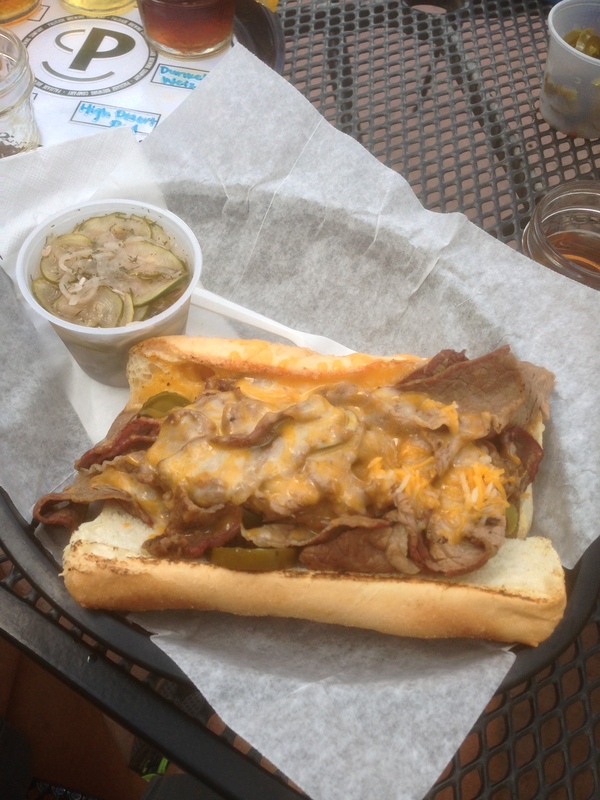 Uber healthy brisket, cheddar and Jalapeno sandwich. I paired it with a cucumber salad to solidify the healthy aspect! 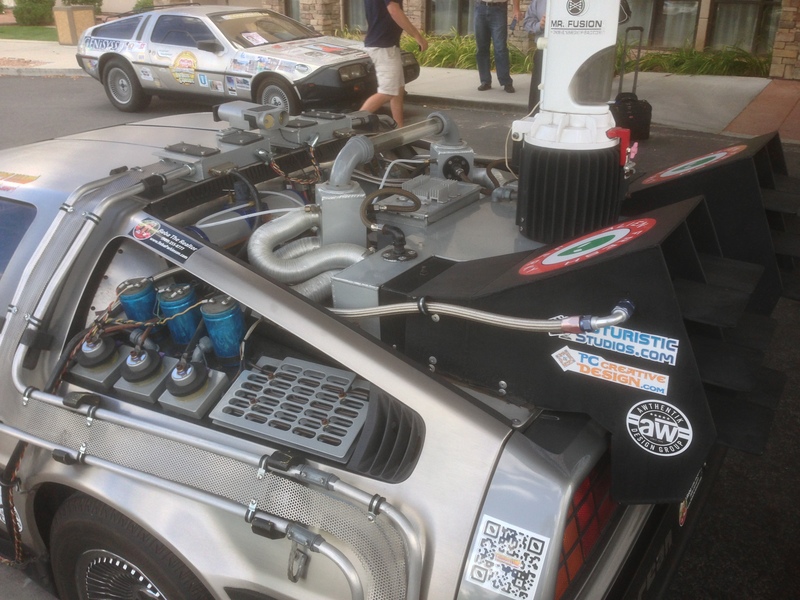 Doc’s car and a companion car, a fairly stock DeLorean, are participating in the Longmont, Colorado to Riverside, California Fireball Run. The Fireball Run is a 2000 mile long scavenger hunt designed to create awareness for missing children and obviously raise funds. Check out the info online and the Facebook page to read about the successes they have had finding missing children. I made my donation to Doc and Team # 15. It is “small world after all”. Team #15 is driven by Paul “Doc” Nigh, a 4th year participant and from my home town of Bakersfield, California. He is a bit younger having graduated from North High in 1974 but sure enough, we had a few mutual acquaintances! Look close – set to 1969 – Not really but could have been! Oh by the way, if your beverage of choice is wine, the area is dotted with small wineries with growing reputations. If you are on Interstate 70, make the decision to slow down and visit Grand Junction, Palisade and Fruita! Grand Junction, Colorado is my stopping point for the week. 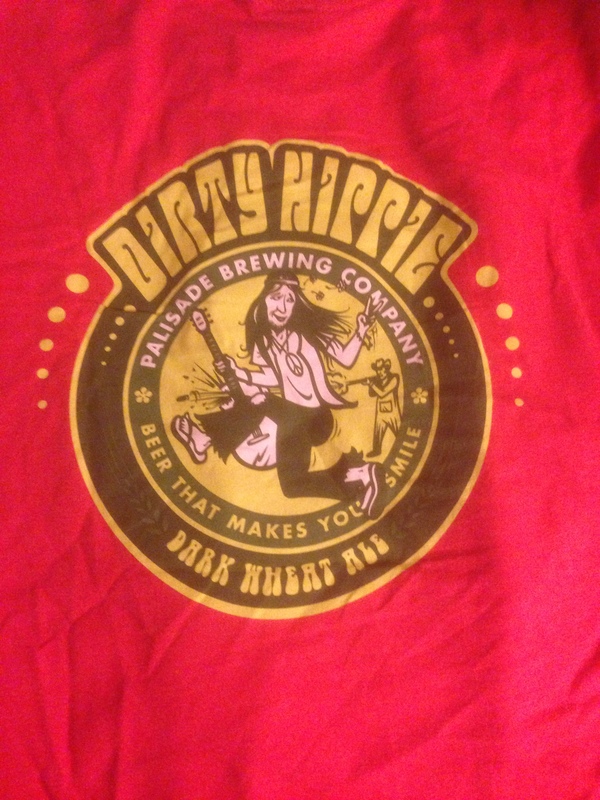 Colorado in general is synonymous with good craft beers. 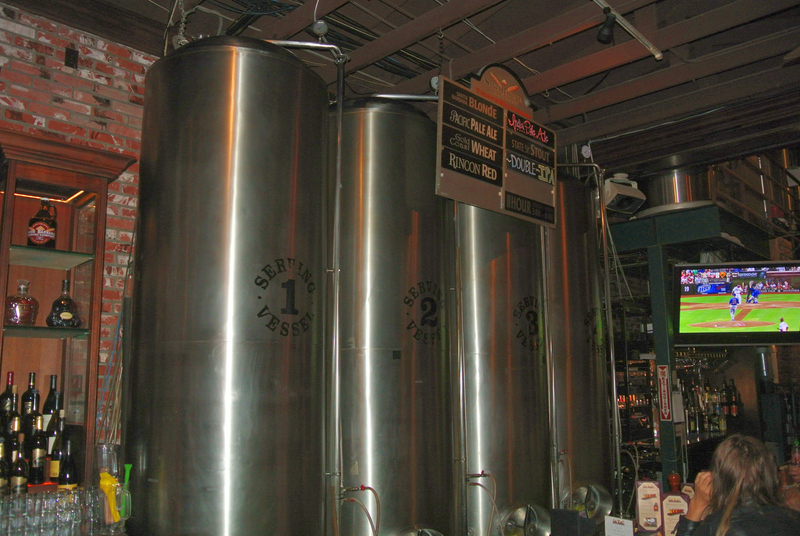 Grand Junction is blessed with 3 local breweries and a couple more in nearby towns. Kannah Creek brewery was my first stop for lunch on my first day. 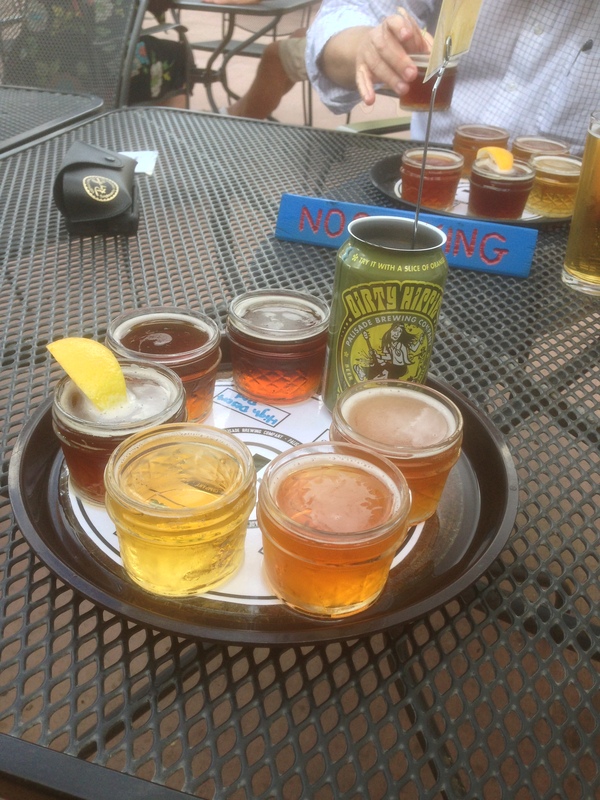 I ordered the beer sampler expecting to provide some input for the choices. 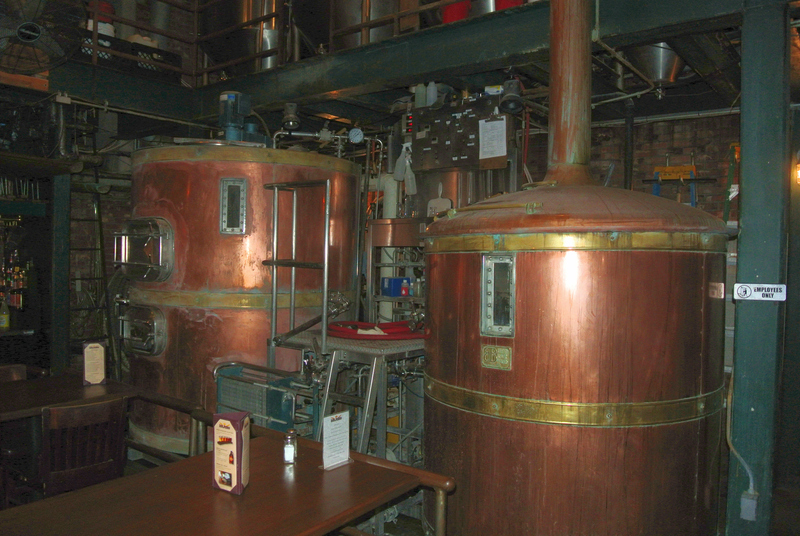 They offer 10 brewed in-house brews. I expected 5 small glasses of beer. I was partially correct. The beers were small, about 4 ounces. The beer count was 10, one of every offering! A man has got to do what man has got to do! (any English majors cringing right now?) Seven everyday brews and 3 seasonals. I worked my way through this daunting task. ESB Extra Special Bitter It was pleasant with good lace and not overly bitter. Island Mesa Blonde was a nice and easy to drink best suited for my wife who likes Blonde Ales. High Side Hefeweizen is very nice, it puts Bluemoon to shame! Well made beer! Kathy, you would definitely like this one! Lands End Amber very drinkable beer, feels and tastes more like a session beer with body but not exceptional. Broken Oar IPA The dry hopping is evident in both the nose and on the tongue! It was one of my two top choices. Standing Wave Pale The ale was smooth in the mouth, had a nice aroma and was a pretty tasty IPA. Pigasus Porter I like it. Not over to top with the heavy roasted flavors- subtle flavors of roasted malt and chocolate. I would like another pint of this one! Black’s Bridge Stout- It was the last beer i sampled. The warming of the beer while I worked my way to it was perfect. Velvety feel in the mouth and the flavors are subtle but distinct. The nitrogen head on this beer lingered well. Katrina was my waitress and beer guide. Awesome beer knowledge and definitely the free spirit – just back from working the summer in Alaska. Interesting young lady! Now off to Rockslide Brewery to sample their offerings. I have heard good things about the Ale House so I may have to flip a coin! Family friends, the Ciliskes, invited a handful of their friends and family out to their ranch near Menard, TX this past weekend to hunt dove. Although we were not out there on the opening weekend of the Central Zone dove opener we had an undisturbed population of dove. All told we harvested about 100 dove, had a great time, drank a few beers – never with loaded weapons in hand – and ate like kings. Dove hunts are a family tradition that I grew up with. Great memories of Grandpa Decker and his old Browning A-5, uncles, my dad and brother. As I moved on more time was spent hunting with my buddies, Mike, Steve and Nate. It goes full circle and I truly enjoyed hunting again with my dad in the years just before his passed away in 2001. I hunted with my boys in Midland building some great memories and now they are in that hunt with buddies stage of their lives. It will come full circle! I really enjoyed the last evening hunt on the Ciliske’s ranch. My son Ben, his girlfriend Cheryl and I hunted the north end. It brought back memories of conversations during hunts with my father years ago. Same words, similar context and further cementing a relationship with my son. A relationship that evolves, but never loses the key element of family love. Wipe eyes and move on! 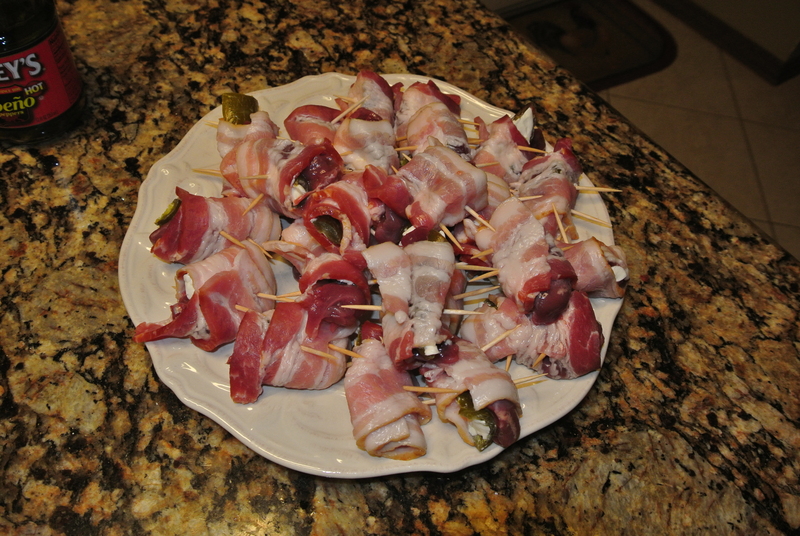 One evening, after we had filled the larder with dove, I offered to make some Dove & Jalapeno Poppers for the crew. 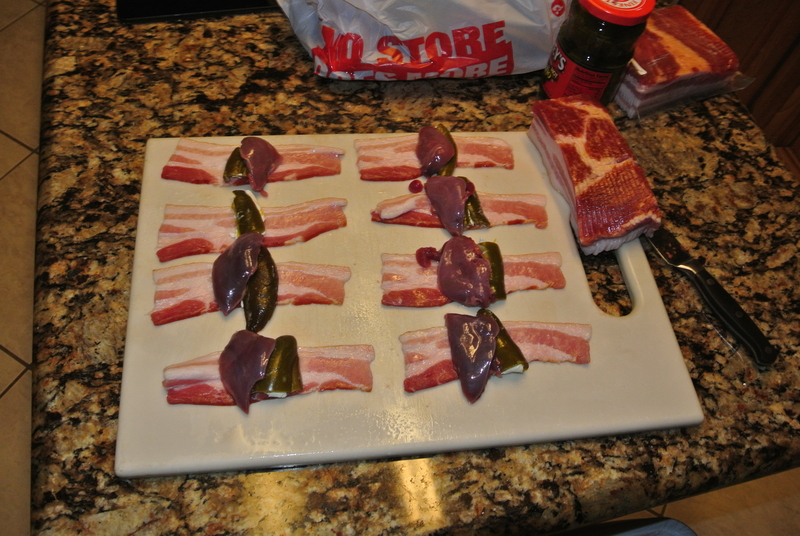 I deboned about 30 dove breast and wrapped them together with sliced Jalapenos, bacon, some cream cheese and salt & pepper. 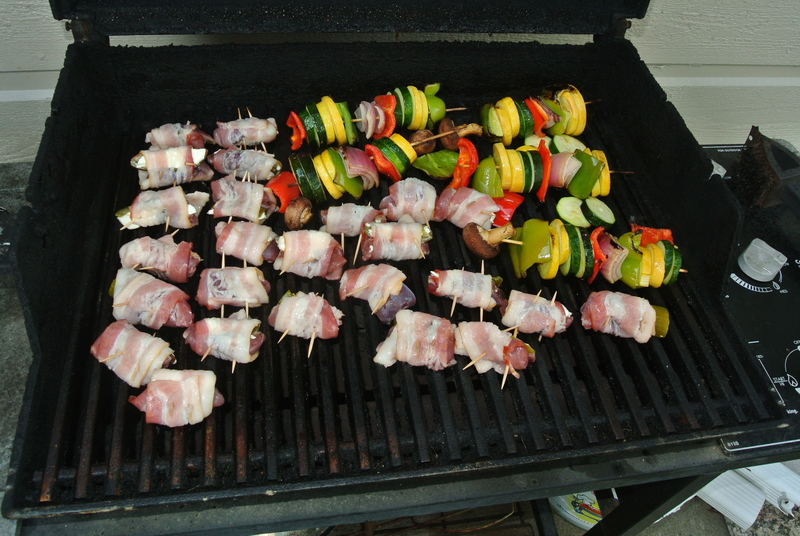 Skewered with a toothpick to keep them together and grilled until the bacon was crisp. I must say – they were a hit. Upon return to Houston I decided to repeat the appetizer again. I made a slight modification. 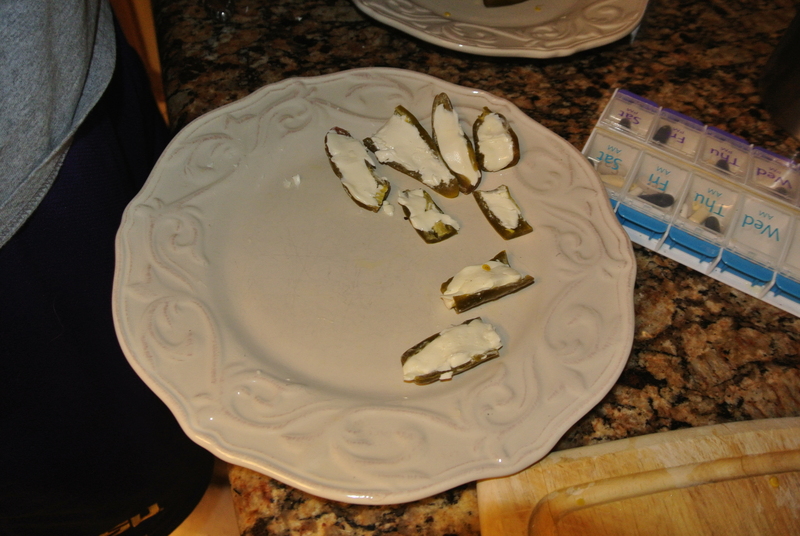 Rather than use sliced Jalapenos I used whole pickled Jalapenos cut in half lengthwise. The cavity after removing the seeds was slathered with cream cheese and rolled together with bacon strips. The halved Jalapenos added a little bit more heat and flavor over the sliced method. Paired with a Sam Adams Latitude 48 IPA and the world was mine. Assembly line wrapping the poppers. On the grill with Veggie Kabobs in an attempt to be healthy! The process went quicker than the ranch poppers as my son Ben stepped up and prepped the Jalapenos. Great flavor – need to do it again! My wife and I recently visited the brewery located on State Street at the intersection with West Haley. My wife, the inveterate people watcher selected the high table located in the front window with views of three of the four corners of the intersection. The corner nearest us was blocked by the building’s corner pillar. State Street can be very entertaining! This evening was almost hilarious! We sat inside with the thick glass between us and the crowds cruising up and down the street. The glass provided a very good sound barrier so we could talk about those entertaining us without offending anyone….we are not mean in our comments but some folks sure stand out from the crowd and yes, we do notice – sometimes out loud. When the migrating crowds had to stop for the lights to change the crowd would get deep and wide outside the window. One thing that made it more entertaining were the antics of the panhandlers on the three occupied corners. One young man that appeared to be ADH to the max was actually working every corner and all the territory in between. I have to pat him on the back, he spent a lot of time on litter patrol and was constantly finding bits and pieces of trash that he tossed in the trash receptacle in the process of finding enough cigarette parts to make a usable stub. My wife commented on how unsanitary that must be. I didn’t say anything but in my mind I was chuckling! She will stumble and fall down stairs rather than risk picking up germs from the hand rail! This is a beer blog isn’t it? Yes it is, we both sample two of the offerings – two each, so we tasted 4 of the beers brewed onsite. Kathy chose the Pomegranate Wheat Ale, the seasonal offering, for her first beer. She liked it and commented how it reminded her of Abita’s Purple Haze but with a definite Pomegranate aroma and taste. She remarked that it was just a one beer thing, not one for everyday drinking. Her second beer was the Santa Barbara Blonde a safe but tasty choice that went well with her Halibut offering. She gave top marks to the halibut and even shared one precious bite with me. I had the Double IPA and it was very nice – loved the aroma- a nice floral scent and it had a crisp but very good bitterness that was not overwhelming. 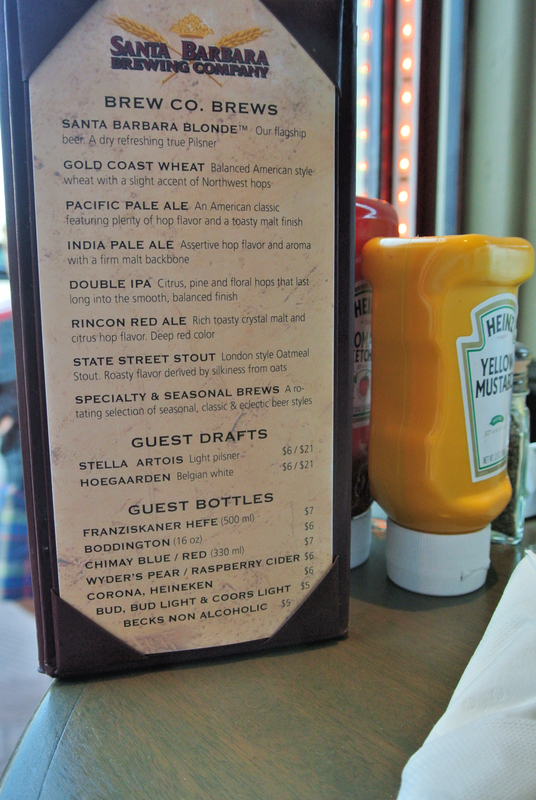 I tried the Rincon Red along with the Santa Barbara Burger – very nice and very California! The wait staff is very knowledgeable about the beers and the menu – the hostess was very new, did not yet have much beer knowledge but demonstrated a zest for customer interaction and a willingness to learn. I gave out a few beer lessons that I am sure she memorized! We sat near her station and she was a great vocal participant in our observations of the ongoing State Street spectacle outside of our window side table. State Street has become a great wine tasting venue featuring many of the local vineyard offerings. We didn’t hit the wine tasting trail. We stuck with what we enjoy….Kathy does enjoy a good Riesling but I can take our leave the wines, beer is my vice, not the only one, but the only one my wife will let me write publicly about……..Just kidding Hun! I have been idle with my beer blog for quite some time. I apologize but I needed to step back and look at what I am trying to accomplish and also ask myself, has my blogging created “a celebration of alcohol” and overindulgence? If you will, did my words allow someone to hit the “Tipping Point”, taking that step over the edge. A sobering thought was in the Houston news recently. The article recounted sentencing for a 24 year old woman, driving well beyond the legal limit causing a fatal automobile accident. She had 21 drinks over a 4 hour period of time. She went well beyond the “Tipping Point”. She forever changed the lives of many and will now have 38 years behind bars to consider her fateful choices. How many opportunities were there to make a better choice or have others to step in and intervene on that fateful night a year ago? I am not casting the first stone – I have been beyond the tipping point and for the most part, I had been “lucky”. Hindsight is so insightful, but for the grace of God, I could have been sitting in this young lady’s cell! I know for a fact that people, people that I love and care deeply for, that have gone beyond the “Tipping Point”! Loved ones that have taken risks that could have changed the lives of innocent people as well as altering their lives forever! I have personally made bad choices, many of them were when I was a young man, but guess what, I continue to make poor choices with the my personal “Tipping Point”. Thank God those times are much less frequent. I will tell you and the rest of the world that the every time my wife and I have had cross words it was due to my being on the wrong side of the “Tipping Point”!. A handful of recent events with very close family members can all be linked to crossing beyond the “Tipping Point”! I enjoyed my class reunion this past weekend. I knew full well that the bar would be open and I would drink a few beers. I had toyed with the idea of taking a cab but decided against it. So off I went. My first trip to the bar didn’t go well – depending on perspective. It was crowded, the bar tender ignored me and I was cornered by old classmates that distracted me with stories from nearly 45 years ago. The distractions continued and I had a great time. Somewhere into the third hour my best friend bought me a beer, the crowd was thinning and we were able to attract the bar tender’s attention! This beer turned out to be my only beer of the night….FYI, it really wasn’t a beer, it was a Coors Light! I had a blast at the reunion. I had intended to drink a few beers but the swirl of old friends, great recollections, varying views of Father Time’s influence on others (not me of course), provided great enjoyment. No beer required. I could have easily had a handful of beers but after a bit it wasn’t the important part of the evening. I did want to dance with one of my classmates, I knew she could be a good swing partner. She had to leave early because she had flirted too hard, not with the guys, but with her “Tipping Point”. It was a bit sad but also a reflection of the evening for too many! I won’t point fingers because three point back at me with a single one pointed at others. “I will try to not point fingers”! I have been very guilty in the past and I know that I will be confronted with my personal “Tipping Point” choices in the future. I like my beer, especially GOOD beers and the temptation is always one more beer away…Lets all help each other to be smart as we enjoy the journey! I commit to helping others by modeling the behaviors to stay on the right side of the Tipping Point. I will not glorify the excesses that I have led me to the “Tipping Point” precipice. I commit to providing the support for those I love, help them avoid poor choices in the future!